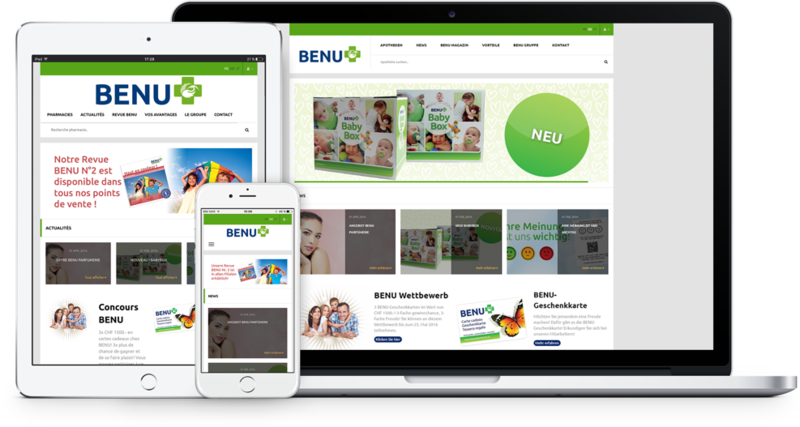 BENU wanted to make their website responsive, and in order to simplify the content management, they decided to change the CMS to a more modern tool than Typo3. Additionally the old platform was very static in the sense that the content was not up to date since no section provided news about the company and their pharmacies. As for many other companies the challenge for B2C businesses that have point of sales in the 3 linguistic regions of Switzerland is that the site and the content management platform must provide multi language management in French, German and Italian. ClickOn developed a new website with a WordPress CMS, to help the content manager have a better and more user friendly platform. The enthusiasm created by the new platform was real and needed for the larger amount of content creation required to make the news section of the website more engaging for the customer and the people browsing the site. The news overview page of the pharmacies was made in a more modern design in which the customer could find the nearest pharmacy with the help of a map and the search function. In a second Step the CMS became a centralized tool to manage the content of the app and the website simultaneously increases the efficiency of content management.